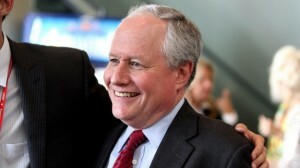 The Raw Story reports Republican political strategist and Weekly Standard editor Bill Kristol appeared on “Morning Joe” Tuesday morning to walk back statements he made to ABC Online on Sunday regarding the political fortunes of erstwhile Alaska Gov. Sarah Palin (R). Whereas two days ago, Kristol said that Palin could “resurrect herself” politically by way of a run for U.S. Senate, Tuesday morning he was far less sanguine about her prospects, saying that she does not “have a future” in politics. Kristol was one of Palin’s earliest advocates in the Republican Party, which he said in the Sunday interview, but added that her decision to quit the governorship in the middle of her first term was a poor choice for someone who hopes to secure a job in government. I don’t know many conservatives that take Bill Kristol seriously anymore. It’s been a long while since he lost his fastball!